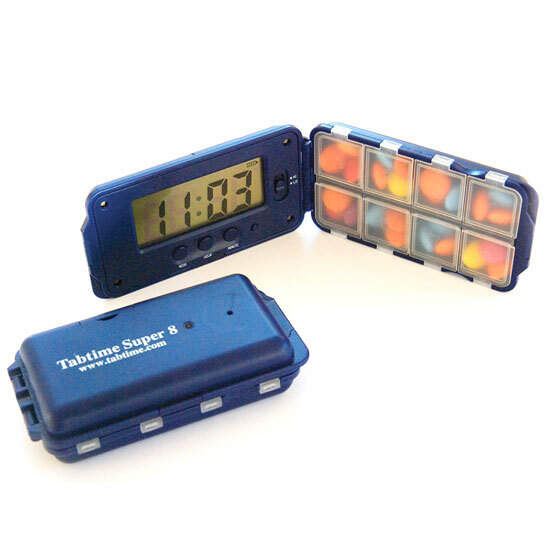 The great new Tabtime Super 8 Pill Box with alarm timer has been especially developed with Parkinson's & Alzheimer's patients in mind, but will benefit anyone who needs to take pills, medication or tablets several times a day. It features up to 8 daily alarms that can be set to any time required with 8 numbered tablet compartments. The alarms settings are remembered every day but can be easily changed at any time. In conjunction with the alarms, a red LED on the lid flashes until the case is opened, providing a visual indication that a dose may have been missed. An easy to open magnetic catch is ideal for those with diminished dexterity and there are two alarm volumes to help those who may be hard of hearing. It has a large screen with clear figures and big buttons that are well spaced out.